As a theatregoer, one is used to several constructs as part of an evening of theatre. Theatre is either fiction, or fictionalized fact (the very word ‘dramatic” has come to mean, something that is emphasized more than is ordinary). The audience is a passive receptor for what happens on the stage. The audience and stage areas are mutually exclusive. All members of the audience get the same narrative. The narrative in a theatre experience has a buildup, a climax and a denouement. It’s not usual to attend an evening of theatre where all these concepts are challenged and, in fact, contradicted, but that’s what happened to me and my friends (Jayashree, Lakshmi and Virginia) when we went to watch “I* – An Immersive Affair With Yourself” at J P Nagar 3rd Phase, on 2 Sept. 2017. I always go to watch a theatre production with an open mind….and I knew from what I’d seen on the net that this would be experimental theatre. I got my first glimpse of the theatre space, on the terrace of a house. This space is untitled, meant for small audiences, with no demarcation of the theatre space at all. welcomed us. We were all asked to leave our bags at the first floor, and went up to the theatre space on the terrace, where lovely warm tiles, frames of pressed-ply boards, and a roof, made up the horizontal and vertical spaces. We were told that some stools would be available, the others could sit or stand and watch the production, as we would be required to move and join the cast during the performance; more about this later. Four talented, agile and versatile actors carried out the performance, each depicting, through movements, playing of instruments or singing, using of props, dialogue, sounds or calisthenics, their own experiences of life. The stage design, if it can be called that, was simple: four large containers, each at a 45 degree angle to the one below it, with a tall stool set on top. From the beginning, it was obvious that, at the very least, the audience was supposed to not just see and hear, but also touch and feel as the narrative unfolded. However, conditioned as we are to either being passive, or to wait for a cue to join the performance, we remained a quiscent audience through the hour-long performance. And through that hour, the four members of the “cast” (I am listing all the names at the end) used their limber bodies, and props they had chosen…string and percussion instruments, a bottle with liquid in it, a potted plant, the receiver of a rotary telephone, a broom, a scarf which doubled as a mask….They moved in a series of graceful and often sinuous movements, across the space, and around those members of the audience who happened to be sitting on stools in the middle of the space. The director was right there, too, but the direction was not overt; like all good stagecraft, it was much more subtle and yet, the directorial touch was very apparent throughout. Aruna Ganesh Ram, take a bow: your vision of this kind of theatre shone through the entire time we watched. Let me comment on some of the aspects of the performance in the usual way I would do for a play. The acoustics of the performance space were excellent, and the music (both instrumental and vocal) were amplified in a harmonious fashion. The meta External sounds occasionally added themselves: fireworks, and the noise of a wedding band somewhere nearby. The space was illuminated by ordinary domestic lighting fixtures (perhaps the two ceiling fixtures were a little more powerful?). Six wall-mounted fans were not needed on this particular, cool monsoon evening. The costumes were what I’d call “contemporary urban ethnic”. I noticed that each costume was a different design, but all of them were a patchwork of just a few fabrics, with sleeveless tops. All the performers had their hair tied in topknots. There were no microphones; the small space did not need them. There were no multimedia effects or any special lighting design. The audio and visual components, in the technical sense, were as simple as could be. This is a performance that can be carried out in the most rustic and basic of spaces. We were not sure which the impromptu parts of the performance were,but were certainly able to spot the choreographed and rehearsed sections: when the performers moved in rhythm, clapping their hands against the floor, or wound themselves in a moving sculpture of a multiplicity of the human form. At various points, they spoke multiple languages (or gibberish, if one did not understand), sniffed at the members of the audience, tied and untied their legs together, laughed, howled, sang, chanted, padded like animals, or danced. The fitness of their bodies, the beauty of the music, the intricate weaving of the choreography: these did not require us to make meanings of them, and we enjoyed them unconditionally. However, the narrative mystified us, and we found ourselves with question marks hovering over our heads. It was definitely an immersive affair…but with ourselves? No..we were not immersed fully during the performance; that happened only later, when we actively participated in the discussion. The performance lasted an hour, after which Aruna announced that there would be a talkback session. Most of us wanted this, so, with a few exceptions, we stayed on for it, and indeed, it was a deliberately crafted part of the performance. Aruna and the performers sat along with us in a large circle. She then described what she called “immersion theatre”, where the performers narrated, through sound and movement, their own experiences in life. She mentioned that the costumes were a deliberate patchwork of fabrics, to metaphorize the difference of narrative with the commonality of human experiences. Several members of the audience asked for the meaning of the performance; Anuradha (who manages the performance space) and Aruna questioned our need to make meanings always. In fact, Aruna said, they had expected the audience members to join in, but on this evening, the audience had failed to do so. Failed…we digested the word and pondered its meaning. Other audience members spoke about the usual divide between the stage and audience space, and the need to have a narrative which they could understand. 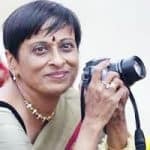 Aruna stood these ideas on their heads; she explained how, when each of us concentrated on what one particular performer was doing, our own narrative of the play would change from that of any other member of the audience. For example when one person raked the dry leaves, the audience member might follow only that person; another would look or touch only the member who touched us with the end of the telephone cord, or sniffed at us. Similarly, when the question of props was raised, she explained how these objects were the end result of a long process of choosing them, ultimately narrowing them down to one per person. Deliberately including the discussion as part of the perfomance was very innovative, and it certainly opened our minds to the new ideas of theatre/performance appreciation. It was like visiting a gallery of abstract art; we did not need, we found, a fictional narrative or play, to hang our entertainment on. We could enjoy, for their own sake, the words, the singing, the playing, the drumming (whether it was on the percussion or with fingers on various surfaces, including the skin on each others’ bodies), the crescendoes of calls, the moments of silence. But our other ideas of its having to “mean” something, of having some fiction presented to us…were turned topsy-turvy. Those who missed the discussion did, indeed, miss a vital part of the production. 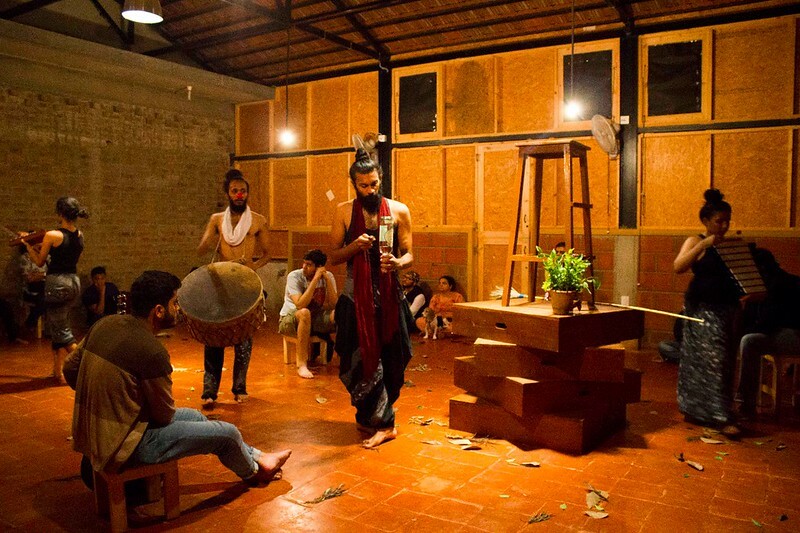 Anuradha mentioned that the space was not meant to exclude outside sounds as theatre spaces usually are. I must mention another truly unique factor about the evening’s performance. A young beagle (if I have the breed right), called Chitty, was part of the audience, and was watching, interested and quiet, throughout the evening. When one actor proceeded to sweep the scattered dead leaves here and there, Anuradha had to hold Chitty back from participating! I have never before had any other living species form a willing part of the audience before. We came away at the end of the discussion with several new questions in our minds, about what we were to expect at a theatre performance, and what preconceptions we had. It was, in a way, like having light bulbs go on in our thoughts: it gave us a chance to rethink our views about theatre and performances: what they have, or do not have, to be. A member of the audience, along with Aruna and the performers, suggested that by not joining in, we failed to make the narrative ou own. However, upon reflection, I feel that we, as an audience, are definitely always expected to keep our seats and keep ourselves aloof from what is transpiring on stage. In fact, I thought that the cue for our joining in would be given by the performers themselves. Hardwired to NOT do anything to disturb the narrative or intervene, we remained a passive audience. In this regard, I would suggest to Aruna that instead of mentioning, as she did, that we *might* have to move with the performaers, she should clearly state that we could join in as and when we wished, and that the cast would take the narrative forward as the situation required. Certainly, had I been told this, I would have joined in; waiting for the cue, I did not. One of the cast talked about how she would earlier have struggled to find a meaning and a context to the performance, and how she’s learnt to enjoy it for what it is, without having to undergo this process. I am, of course, still full of questions. Was it deliberate that the performers are all young, lithe and so athletic? Why were we asked to leave our bags on the floor below, when we could just as easily have arranged them at the edges of the performance space? Having lost my purse and various cards (those pieces of plastic essential to daily living, and so difficult to replace!) recently, I was certainly anxious about leaving them behind. And having to wear special footwear for a bone growth in my foot, I was not very comfortable about going barefoot, and could not, for example, have joined in any robust movement. A very recently painful knee allowed me to sit on the ground, but would have proved a difficulty if I’d got up repeatedly to join in the performance…another reason I stayed quiet and passive. Also, expecting that any member of the audience will stand through more than an hour of the show is a little unrealisitc…all of us have come from various hectic activities, and we are not expecting to be that active physically! So a mention of this online would be good, too. Certainly, I would suggest that more small stools could be provided. We were four of us, and we did not want to corner the market on raised seating! Another small point. I’d asked another friend, and my daughter, too, to attend the previous show on the evening of Saturday, the 2nd of September. But when I spied Chitty, I was glad that my daughter had not been able to make it; she is very allergic to dogs, even non-hairy ones, and I do know friends who are not fond of dogs at all. So, if Chitty (or any other pet) is to be part of the audience in any future performances, this should be clearly mentioned beforehand. Please, do add that the talk session at the end is part and parcel of the performance. That would prevent some of us from leaving and, in the process, getting far less from the show than we should. The evening’s experience was summed up by Virginia, as we returned home. “It’s a very new experience for me,” she said. “I am still thinking about it all, and organizing my views.” Yes…that was, perhaps, the “meaning” of the performance, as an audience member asked: it made us think about what theatre is. Following your work, Visual Respiration, and more power to you! Readers, do go for this production; instead of accepting the usual, you will wind up examining the unusual. Artistes: Deepthi Bhaskar, Vijay Krishna, Vedanth Ramesh, Laxmi Priya S. N.